RANDOLPH — Late in the fourth quarter of Thursday night’s Division 1 East basketball game at Randolph Central School, Lucas Burch, a Cardinal alumnus, walked to one end of the gym carrying several bags that appeared to be filled to overflowing. 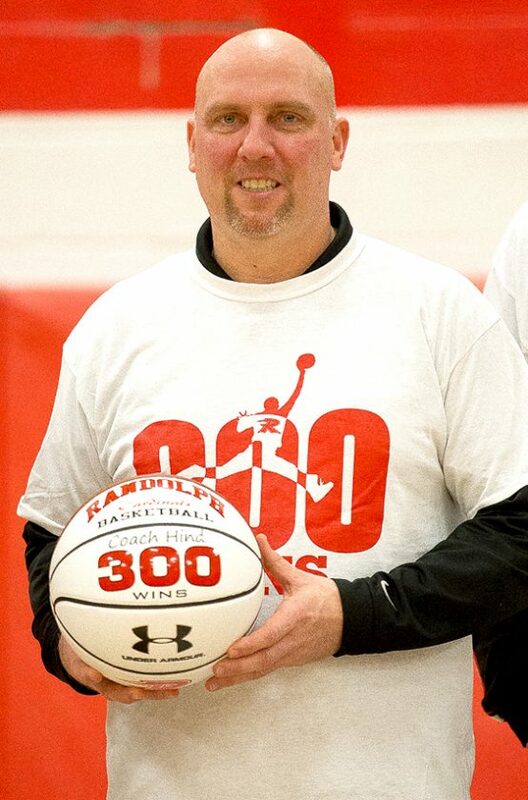 Once the final buzzer sounded — the Cardinals downed Salamanca, 49-35 — the near-capacity crowd was asked to remain in their seats, the bags were opened and current and former Randolph players of Coach Kevin Hind were presented T-shirts with “300 Wins” emblazoned on the front. It was a gift for them, sure, but, more importantly, it was a special tribute to Hind, the man who has guided the program to that milestone victory total over the last two decades. How Hind got to Randolph in the first place is pretty remarkable. Growing up in Frewsburg, Hind was an accomplished athlete. In fact, as a senior in 1991, he was part of a New York State Public High School Athletic Association championship baseball team. But basketball was always his favorite sport. Sometimes, he’d find pickup games with Frewsburg alums like Bill Hair, Dan Moore, Mike Conlan and Tom Nelson. Ultimately, he ended up at Jamestown Community College where he played two years for Ken Carrillo before heading to SUNY Brockport where he played for two more. Upon his graduation in 1997, Hind began to execute his game plan of becoming a teacher and a coach. “The two were together. Always,” he said. As luck would have it, he coached in the summer basketball league that year for then-Jamestown High School mentor Ron Frederes. It was during that time that Hind became acquainted with Pat Slater, who was then coaching the Randolph basketball team. Apparently liking what he saw in Hind, Slater put in a good word for him with the Randolph superintendent and, by August, Hind received a phone call from the superintendent’s secretary asking him if he’d like to come in for an interview for an elementary teaching position. “I remember at home jumping up and down our dining room table,” Hind said. Hind ultimately got the job and became Slater’s jayvee basketball coach in 1997-98, a season when the Cardinals’ varsity team won a Section VI championship by rallying from a 14-point halftime deficit to down Portville in the title game. Hind’s passion has never wavered. As the start of the 1998-99 season approached, Hind was planning to remain as the jayvee coach under Slater. “I expected Pat to be coaching another 20 years,” Hind said. “I walked into the faculty room one day in November — the season is literally a week away — and all the old guys in there are like, ‘Congrats, Coach.’ I’m like, ‘What are you talking about?’ I was told that Pat resigned out of the blue. Since that surprising job promotion, Hind has won five sectional titles and made one trip to the NYSPHSAA Final Four in 2003. In other words, it has been quite a run for him at the Cattaraugus County school. Led by Hind’s oldest son, Tyler, this year’s team is 14-3 heading into tonight’s nonleague road game against Health Sciences. It was not surprising then that after last night’s game, Hind was the recipient of celebratory hugs and handshakes from countless folks upon reaching the 300-win plateau. With his youngest son, Drew, in sixth grade, combined with a strong group of middle-schoolers waiting in the wings, the future remains bright for the Cardinals program moving forward.